The last two weeks of February have been slam-packed. 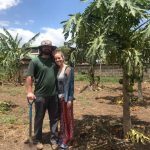 Samantha and Joe Burns, my sister-in-law and brother-in-law, came back to Tanzania with us to help us with some final projects. Joe is a horticulturist who owns a nursery in Grovetown, Georgia. In November of 2017 he came, and along with members of the Central Church of Christ in Augusta, helped us start our grove of fruit trees. Only one year later many of these trees are doing well. He helped us replant those that are not and reassess what grows well where we are and just overall improve this project. Fifty more trees were planted and all of the trees were trimmed and the Tanzanians were taught general maintenance. We were also able to get the corn and beans planted. The rains are supposed to begin this weekend and we pray that God blesses this new crop. The greenhouse was also cleaned out and tomatoes and peppers were harvested for the school. Then, we replanted sunflowers in the greenhouse in the hopes that this will keep out the birds. Bekah, Anna, and Samantha harvested the carrots from the garden. It was awesome to see the improvement in our soil in the last three years. In 2015-2016 we tried to grow carrots but the soil was too hard. However, this month we harvested 75 kg of carrots (165 lbs), 8 kg of peppers ( 17.6 lbs), and 44 kg of tomatoes (96.8 lbs). More has been harvested over the last three months of the tomatoes and peppers this was just the final harvest before we cleaned the greenhouse. Anna and Samantha had a busy two weeks while Joe and I worked on the farm. Two days after arriving in Tanzania they held a women’s seminar at the Kisongo church. The theme was “God Heals the Broken” and there was a great turnout and wonderful responses to the lessons. Anna was thrilled to get back to her Wednesday bible class at the local daycare, Walk in Love. The children welcomed “Auntie Anna” back with gleeful screams and loved learning about Joshua and Jericho. The neat thing was many of the children were new but the nannies had taught them the Bible songs while Anna was away. 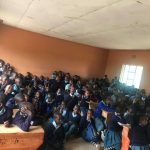 On Friday they went to the local school where Anna, Paulina, and Mama Kashumba (both Tanzanian members of the Kisongo church) taught the children at the local public school. This year they have more kids than ever before. Even the floor from front to back is filled! A quick head count showed around 160 children (last year averaged around 120). On Saturday Samantha held a children’s seminar for the local children of Kisongo at the Kisongo church of Christ. 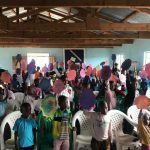 More than 100 children came and learned about David and Goliath and having a shield of faith in their lives. There were lots of games (like throwing “tape rocks” at Goliath’s head and dodging satan’s fiery darts with shields) and the children even acted out the story of David and Goliath at the end. We are grateful to be back home in Tanzania. Please keep the church here in your prayers and the wonderful work they are doing to further grow the Kingdom.